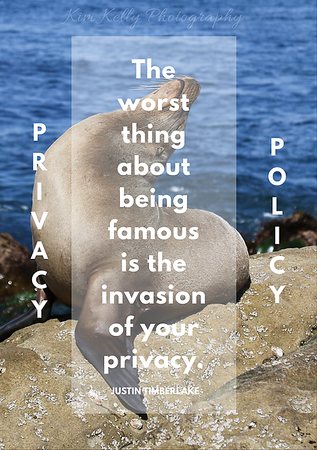 While we may not actually be famous, I think we can all identify with the fabulous JT - none of us wants our privacy invaded. First off, according to site reviews from third parties, you can consider Liv Life a safe space. Any data ever collected by Liv Life will never be sold or used in for unlawful means. I currently have no means of data collections with the exception of comments and the use of Google Analytics. I've toyed with the idea of turning comments off as there is no way to opt-out of leaving an email address. But then comments (other than the immense amounts of spam I receive daily...) are truly one of the reasons I started this blog, without communication, questions and the ability to answer questions there is a big part of the "personalness" missing. So... I vote to keep the comments, and if you don't want to leave your email, skip the comment. Email me! Info in the contact section. * If you do not want to leave an email while commenting please skip the comment. I also use Google Analytics. Yes, Google Analytics collects data when you visit and I believe leaves some sort of cookies on your computer (which I think happens when you visit almost any site). Nothing really personal, but mostly likely collection of your IP Address and I'm guessing where you are. It also tracks what you look at and how many people come to my site. Then when big companies ask to work with me (believe it or not this has actually happened a time or two!) I can tell them where most of my audience is, what kind of posts they like the best, and how many people on average actually look at Liv Life every day. *Google Analytics leaves cookies and uses some of your information for analytical purposes. If you wish to opt out of this please click here: Google Analytics Opt Out. In the past I've had an email list where guests signed up for to receive notifications when we post a new blog post. According to GDPR rules I need to send you an email to say you really do want to receive those notifications and if you don't respond I need to delete you. As such, I've currently deactivated the notification service as that service I use is pretty much archaic and doesn't seem to offer a re-opt-in as far as I can see. We will work to find a new service in the future, and when we do we will only collect emails to be used for notifications such as blog posts and newsletters. And we will do everything in our power to keep those emails safe. So there you have it. Liv Life doesn't use, sell, or store any data about you. If you actually read this, wow... and thanks! We're doing our best to meet all the rules and we're happy you are here. Now, lets move on to more exciting topics like Food, Photography and Travel! Tell me your next travel destination??! !